Say it isn’t so, I am holding on to these summer days like it is nobody’s business. Friends are telling me it’s 80 degrees, 90 degrees, 100 degrees! But not here, this is Maine, it got down to 40 degrees last night with frost warning in Northern Maine for Pete’s sake, it warmed up to 70 degrees and I am still picking zucchini’s from my flourishing garden. I could make Lemon Zucchini Cake for my whole neighborhood and that wouldn’t put a dent in my zucchini’s, come over , help yourself! 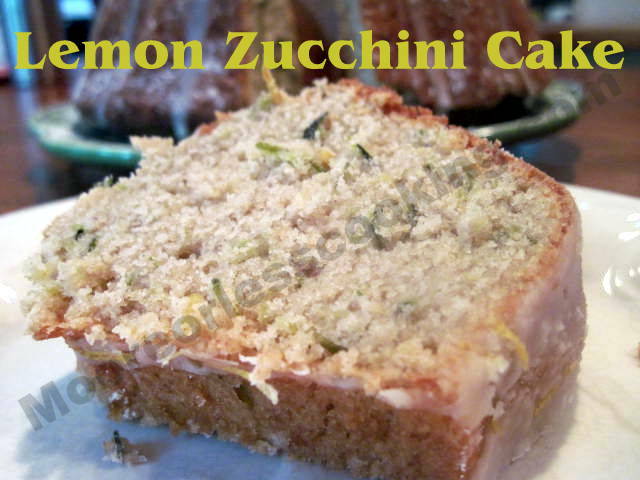 This is a wonderful cake recipe, it tastes lemony and so healthy with wonderful zucchini. Perfect for breakfast too, or a snack, or just whenever. It’s not a fru fru cake, it has body. The lemon glaze is a perfect addition. I baked this cake in a bundt pan, next time I will try it in loaf pans. Preheat oven to 325 degrees F. Grease a 6-cup bundt pan with butter and dust with flour. In a large bowl whisk together flour, baking powder, cinnamon and 1 teaspoon salt. Grate the zucchini on the large holes of a box grater then wring out most but not all of the water by placing it in a clean kitchen towel and twisting it. Stir together the eggs and sugar, then stir in the melted butter, zucchini, vanilla, lemon zest and juice. Transfer batter to the pan and bake about 1 hour or until a toothpick inserted in the center comes out clean. Transfer pan to a wire rack and let cool 15 minutes. Run a paring knife around the edges then turn out onto wire rack or cake dish and allow to cool completely. Once cooled make the glaze by whisking the sugar and 1 tablespoon lemon juice, add more if needed. The glaze should be thick but will run off the spoon when lifted. Top the cake with spoonfuls of glaze then sprinkle with lemon zest. Refrigerate leftovers. So I made the cake this morning, all I have to say is Holy cow… It was super moist and oh so yummy.